Bavarian Auto Recycling wants to make as much information available to the consumer as possible as well as share its many years of automotive experience. Here you will find many cost saving tips as well as helpful advice to make your experience with Bavarian the best it can be. A new engine always requires a few adjustments that will ensure optimum performance and longevity. The first thing you'll need to do with your new engine is change the oil after only 500 miles. During these first 500 miles the engine is breaking in. This process creates very small metal particles which are a normal part of new engine wear. These particles can build up in your oil and fitler and lead to premature engine wear. By changing your oil at about 500 miles you will remove these break-in particles before they can cause any harm. After this 500 mile break-in period, only normal oil change intervals should be required (every 3000 miles). Another adjustment you should have done to your new engine is to have the head re-torqued after about 100 miles. Re-torquing the head will prevent premature oil leaks and maintain proper cylinder compression. If you think your engine is finally broken in - guess again. Bavarian also recommends that you have your valves adjusted after the first 500 miles. This step is not mandatory, but it will maximize your engine's performance and make sure your BMW engine continues to operate properly for years to come. Bavarian Auto Recycling shocks the competition with its five year prorated rebuilt engine warranty. Although our warranty rate is less than 1%, we offer BMW owners who are faced with a warranty engine replacement some real peace of mind in their time of need. In addition to a free replacement replacement engine and free delivery for the first two years, we also cover the labor to reinstall it. This labor guarantee is unprecedented in the rebuilt engine industry. Engine purchasers with warranty claims will be reimbursed for up to $500 in cash to help offset the labor costs of installation. We're also offering a one week rental car allowance (up to $200) while your vehicle is in the repair shop. During years 3-5, replacement engines are shipped based on maximum mileage limitations and a fair pro-rated surcharge. (See warranty terms for details). Although nobody likes warranty claims, at least Bavarian does something to address the real concerns of BMW owners during the warranty service experience. If your not doing the installation yourself, then we recommend you use a BMW specialist in your area. But what if you don't know a good BMW mechanic in your area? The answer is Bavarian's "Repair Referral Program." We've compiled a list of reputable, qualified repair shops in your area that you can use to have your BMW repaired. All you have to do is call Bavarian and ask for a repair referral. The only information you'll need to give is your city, state, and zip code. It's that easy and no purchase is necessary to use the program. Once you have your BMW engine installed and broken in what should you do as far as continuing maintenance for your engine? We've put together a list of all the things you'll need to do on a scheduled basis. These are basic guidelines and by no means encompass all of the maintenance necessary for the entire vehicle. To start, and most importantly, you should have your oil and filter changed every 3,000 miles. Good clean oil means a clean engine. With regular replacement of oil and filter you will ensure that your engine will never run short of precious lubricating oil and maintain the proper viscosity for maximum protection against heat and friction. With today's fuel injected engines it's a good idea to keep your injectors operating in top condition. To achieve this we recommend that you use an injector cleaner (in stock at Bavarian or your local auto parts store) every 10,000 miles. These cleaners use special solvents that will actually remove deposits from within the injectors and allow proper fuel flow to the engine. The next order of business is the ignition system. After all, without a spark there is no fire.. and fire is what puts the power to the pavement. 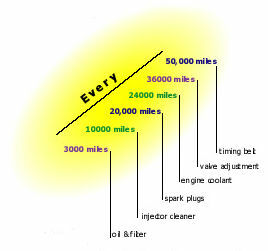 You should have your spark plugs replaced every 20,000 miles to keep the engine running at optimum performance. And while you're at it have your distributor cap and rotor checked for any corrosion on the contacts. By 24,000 miles your engine has done a lot of work - hot work. As the engine continually cools itself with the radiator and coolant, the fluid slowly begins to break down and impurities my become visible. At this time you should have your engine coolant changed and your system flushed . This can be performed by just about any auto mechanic and only takes about half an hour. KEEP THOSE VALVES ADJUSTED! Yes, your valves do require a continual checking in order to keep the engine running at its best. We recommend that you have them adjusted every 15,000 miles. This will not only improve performance but will also prevent premature wear on the cam and rockers. Finally, and most importantly, you should have your timing belt replaced every 50,000 miles.. period. While this might be a somewhat costly procedure, it is still far less expensive than replacing your cylinder head or entire engine. When a timing belt or chain breaks, the "sync" between the crankshaft and the camshaft is thrown off and the pistons could (and usually will) hit a valve or two. This will result in either a bent valve or a damaged piston or both! So it is in your best interest to have your timing belt replaced when scheduled. Don't risk it. Don't be tempted! If your engine has a broken timing belt, a flat cam, or a cracked head. . . don't be tempted into replacing or rebuilding your head unless it has less than 100,000 miles on it. This can create big problems in a very short time. Installing a rebuilt or new head on an older engine can result in blowing up the bottom end of the engine. This is caused by the increased cylinder pressure from the tight sealing valves of the new head. The old bottom end cannot compete with the increased pressure created by the new head and will soon start to burn oil and lose compression resulting in the need to replace the entire engine. So don't take chances--if your engine has over 100,000 miles, opt for a complete engine replacement. Its not worth the risk. However, if your vehicle has less than 100,000 miles on it, Bavarian also carries a complete line of quality rebuilt cylinder heads for most BMW models.